"That Rackham's last subject in book-illustration should have been one in which he took especial pleasure...demonstrates a kind of poetic justice not commonly found." In the summer of 1936, American publisher George Macy of the Limited Editions Club visited Rackham to commission him to illustrate a new book. Though originally there to inquire about The Crock of Gold, Rackham offered to illustrate an additional story for him. 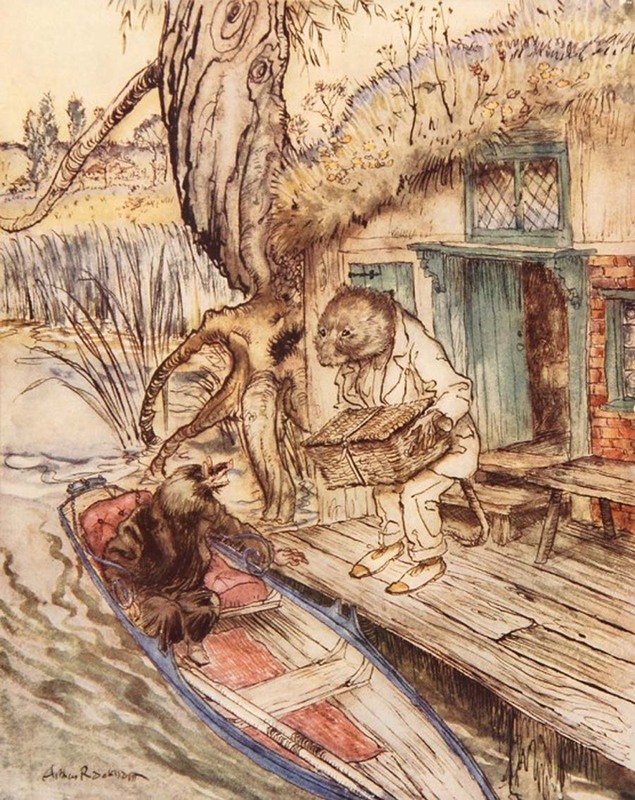 Macy suggested The Wind in the Willows, a work with sentimental value to Rackham since he had turned down the opportunity to illustrate it thirty years earlier when he was busy with illustrations for A Midsummer Night’s Dream (1908). He told Macy that he had regretted that decision ever since and that he welcomed the opportunity to illustrate it now. When Rackham turned down Kenneth Grahame and his publishers decades before, the book had been published without illustrations and remained so until 1931. 1. Derek Hudson, Arthur Rackham: His Life and Work (London: Heinemann, 1960), 149.